The application will be assessed by President Emmanuel Macron who makes the final decision of which applicants France will submit to UNESCO. Tahitian dance is a beautifully enchanting art that originates from ancient traditions on The Islands of Tahiti. Tahitians express themselves through Ori Tahiti, representing their ancestors through this spiritual art and cultural practice. In the beginning, Ori Tahiti represented movement and life of the Polynesian people, and now through centuries of storytelling and ancestral interpretation, Ori Tahiti is an expression of the history and the evolution of the Tahitian culture. 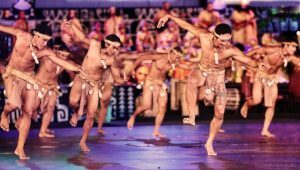 If Ori Tahiti is recognised by UNESCO, it will follow the recent recognition of Taputaputatea marae in Raiatea as France’s 44th UNESCO world heritage site, which was awarded in Papeete earlier this month. The Tahitian island of Fakarava is also designated as a UNESCO Biosphere Reserve.